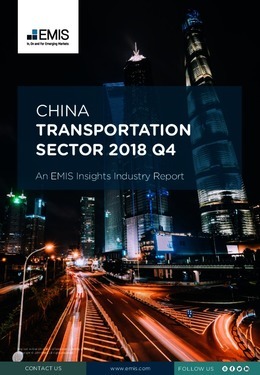 In the third quarter of 2018, total passenger traffic in China saw a slight decrease of 1.3% y/y to 4.7bn persons, due to declined passenger traffic in the highway subsector. In Q3 2018, highway passenger traffic slid by 4.8% y/y to 3.5bn persons, as the reduction of road tolls made more people using their own cars for travelling. However, the total passenger turnover in Q3 2018 climbed by 5.3% y/y to 948bn person-km, thanks to increased passenger turnover in the air and railway transportation subsectors. Passenger turnover in the air subsector during this period rose by 12% y/y to 281bn person-km and passenger turnover in the railway transportation subsector increased by 6.7% y/y to 422bn person-km. This report provides a complete and detailed analysis of the transportation sector for China. EMIS Insights presents in-depth business intelligence in a standard format across countries and regions, providing a balanced mix between analysis and data. Build a clear picture of trends and issues for sub-sectors (e.g. road, rail and water), as well as transport infrastructure.